The shape of the landscape is controlled by the differential weathering of rock units of differing resistance to weathering and the structural geometry of those rock units. In humid climates like eastern north America, fine grained sedimentary strata, such as shale, and carbonate units, such as limestone, are less resistant to weathering and form valleys. In the same climate, coarse grained clastic sedimentary units like sandstone and conglomerate are more resistant to weathering and form the ridges. In arid climates like the desert southwest limestone is resistant to weathering and forms cliffs just as sandstones do. Layered igneous rocks (flows and sills) are generally more resistant than sedimentary rocks because of their low porosity. Sediments are laid down layer upon layer with the oldest on the bottom and the youngest on top. Since sedimentary layers are originally horizontal, in areas where the strata have not been disturbed it would theoretically be possible to find only one sedimentary formation exposed over a wide geographic area. However, streams erode through the younger strata, exposing the lower-lying older strata. In areas of flat-lying (undeformed) strata, the following characteristic landforms are found. In humid climates where bedrock is mantled by thick soil and vegetation there are few cliffs, only in the most resistant strata. We mostly find reversals of curvature of mantled slopes to indicate differences in resistance. In areas where sedimentary strata have been deformed into folded or otherwise tilted structures, regular patterns of sedimentary rock layers are observed at the earth's surface. Valleys underlain by non-resistant strata like shale lie between ridges upheld by resistant strata like sandstone. Homoclinal ridges formed by the resistant beds are typically asymmetrical (if the strata don't dip too steeply) with a steep scarp slope and a more gentle dip slope. The dip slope lies at or less than the angle of dip of the beds while the scarp slope maintains a steep slope by undermining and mass wasting due to rapid weathering of a less resistant stratum below. An initial dendritic stream pattern will develop into a structurally controlled trellis pattern as streams drain the linear valleys. Anticlines are folds with the sedimentary strata dipping away from the axis of the structure and the oldest strata exposed in the core. Synclines are folds with the sedimentary strata dipping toward the axis of the structure and the youngest strata exposed in the core. Anticlines and synclines show up as long linear parallel ridges and valleys. If the axis of a fold does not remain horizontal for long distances the fold tapers to an apex where the limbs meet, typically in a V-shape. Such features are called plunging anticlines and plunging synclines. Some large-scale folds are circular in outline. Domes are like circular anticlines with the oldest strata exposed in the middle. Basins are like round synclines, with the youngest strata exposed in the core. Anticlines, synclines, domes, and basins are terms that describe the exposure pattern of the sedimentary strata and not the surface topography. For example, the core of an anticline does not necessarily form a ridge and a structural basin is not necessarily a topographic low. The actual topography may be controlled by the symmetric patterns of the exposed strata, but the highs and lows are determined by which sedimentary units are more and which are less resistant to weathering (differential weathering). Fault scarps (escarpments) are common features of faults. However not all scarps are fault scarps. They may also form as a result of erosional processes, for example on steeply-dipping sedimentary strata, or by mass wasting, for example slumping or rock slides along steeply-inclined joints. Fault scarps may be modified by erosion. Streams flowing from hanging valleys on top of a scarp will cut down forming deeply-incised V-shaped valleys (wineglass structure) yielding and cutting the scarp into a series of triangular facets. Faults move in discrete events (earthquakes). So, periodic earthquakes in the vicinity of a major escarpment is good evidence that it is a fault scarp and that it is still actively uplifting. Fault offset in an earthquake may be very small (millimeters or centimeters) in scores of small earthquakes. But if large stresses build up on the fault, periodic large earthquakes can offset a fault up to 5 to 10 meters at a time. Normal faults, which form in crustal extension, are high-angle (~60°) faults where the block lying on top of the steeply-dipping fault surface (the hanging wall block) slides down the fault surface. The other block (the footwall block) rises up because of the reduced weight as the hanging wall block is removed from it. The uplifted block forms a fault-block mountain or mountain range. A fault block mountain is also called a horst. In some areas of broad regional extension, a large number of normal faults cut the crust into a series of sub-parallel fault block mountain ranges with linear basins in between. The downdropped basins are also called grabens. A good example of this kind of faulting is found in the Basin and Range of the western United States. Most of the basins have internal drainage (no through-going streams), so the spring runoff forms playas (lakes) that evaporate in the arid heat. Over many years extensive salt flats form in these evaporating basins. In other extended regions, normal faulting is limited to a narrow belt(s). 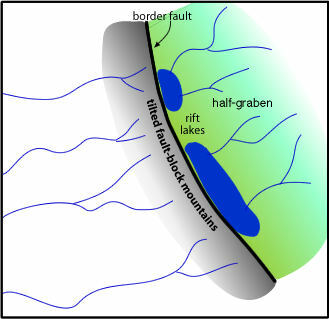 For example, in the East African Rift system and in the ancient Newark structural basin and other coeval rift basins of eastern North America, half-grabens have subsided and rotated downward along major border faults, single normal faults bounding just one side of the basin. The border faults are curved (listric faults); they are steep at the surface but flatten at depth. This allows the basin to tilt downward toward the fault. Rift lakes lie in the depression near the border fault. African rift lakes include Lake Malawi, Lake Tanganyka, Lake Turkana, and Lake Kivu. Volcanoes also develop in rift systems as the continental crust is thinned. Mt Kilimanjaro is the most famous of the African rift system volcanoes, but many others dot the African landscape, including Nyiragonga which erupted in January, 2002 sending lava flows through the city of Goma (eastern Congo) and into Lake Kivu. As the footwall block rises along the border fault it also tilts because only its free end is rising, yielding a tilted fault-block mountain. Inspection of a physical map of Africa will show that on the western side of the rift in this region of Africa stream drainage is westward, away from the tilted fault-block mountain that borders Lake Kivu and the region to the north and south of it. Streams to the east of the rift flow westward into the half-graben, toward the lakes and toward the border fault. Strike-slip fault are vertical faults that form as a result of shearing stress such as near transform plate boundaries. Offset streams, fences, roads, etc. are clear signs of active fault motion. For example, some streets in the San Francisco Bay area are being offset at a rate of more than an inch per year. The maximum displacement on the San Andreas Fault during the great 1906 earthquake was about 25 feet, which occurred in essentially one sudden motion.